Last night at the Hard Rock Casino in Las Vegas, NV, Abner Mares and Joseph Agbeko waged a thrilling battle for the IBF bantamweight title in a bout that will unfortunately be remembered as a foul-fest. Challenger Mares spent the first two rounds attacking the champion in an effective two-handed assault that put Agbeko back on his heels. 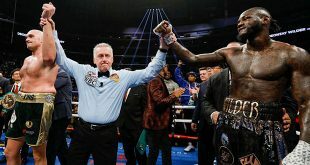 The scintillating performance was marred, however, by the first instances of what was to be numerous low blows from Mares that, aside from a few motions to keep the blows up, went largely un-addressed by referee Russell Mora. Another refereeing mis-step occurred in the first frame when Agbeko hit the canvas after wheeling out of control from missing a wild hook but was counted for a knockdown. Mares slowed down in the third, and Agbeko managed to start putting together an offense but the challenger was still showing superior handspeed, landing combinations in bursts. The fourth saw Agbeko land the best punch of the night, a huge counter right that buckled the knees of Mares but the challenger managed to stay upright. The sixth saw a clash of heads that left Mares with a cut above the right eye, causing the challenger to slow down for a few rounds and the injury never became a hindrance. 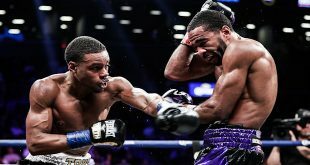 Over the second half of the bout, Agbeko managed to control more of the action as he had Mares backing up and on the receiving end of a hard effective jab but the rounds were difficult to score as Mares picked his spots well, reeling off barrages of shots. Despite getting hit with numerous low blows, that continued to be unaddressed by the referee, Agbeko marched on and scored with well-placed single shots, mostly right hands. The tenth saw Agbeko begin to wilt from the shots below the belt, as time was takes to allow him to recover from one, yet still no point was taken by referee Mora. The low point, literally, came in the 11th when Agbeko was nailed right on the cup, directly in front of referee Mora, and fell to his knees. Amazingly, Agbeko was assessed a knockdown but beat the count and fought on as the tide shifted between the fighters until the close of the twelfth. When the cards were read, Mares won a majority decision by scores of 113-113, 115-111 and 115-111. Mares win the IBF bantamweight crown, improving to 22-0-1 (13), while Agbeko drops to 28-3 (22). Given the controversial nature of the bout, a rematch is almost certain to take place. The undercard saw heavyweight prospect Eric Molina, 17-1 (14), capture the vacant USNBC belt by halting Warren Browning, 14-2-1 (9), in the third round. Former WBA flyweight champ Eric Morel, 45-2 (23), stopped Daniel Quevedo, 13-12-2 (8), in the fourth during a bantamweight contest. In a battle of sluggers, light welter Angelo Santana, 11-0 (8), won the vacant WBA Fedecaribe belt by finishing off Ramzan Adaev, 8-1-1 (7), in the second. 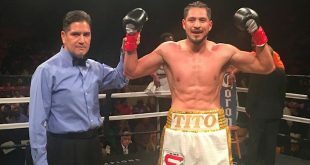 Lightweight Juan Monteil, 5-4-3 (2), pulled off an upset of sorts, holding previously undefeated prospect Carlos Molina, 14-0-1 (7), to a draw, despite giving away six pounds to the 143 pound Molina, over eight rounds.